Caterpillar Local Host Plants: Vatica pauciflora (Dipterocarpaceae), Vatica rassak (Dipterocarpaceae), Vatica maingayi (Dipterocarpaceae). 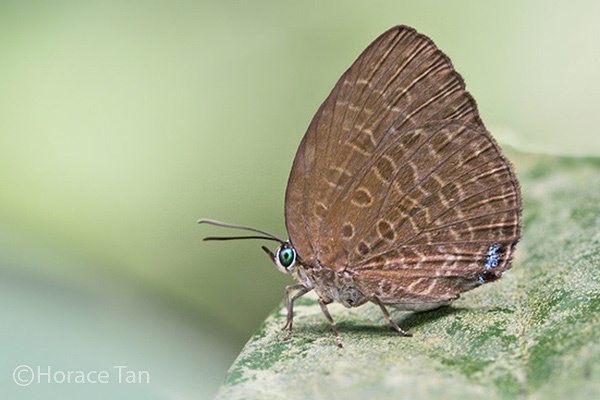 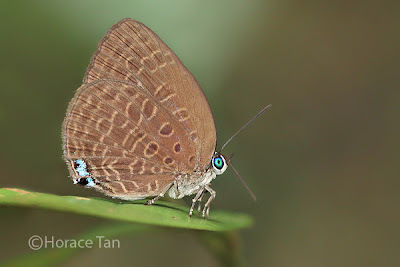 A female Common Disc Oakblue resting on a leaf perch between oviposition runs. 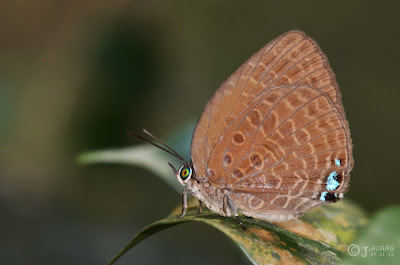 Above, the male is deep shinning blue with a thread-line dark border on both wings, and on the forewing there is a broad circular discal patch; the female is shinning blue with very broad dark borders on both wings. 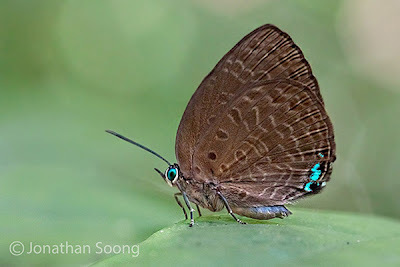 Below, the wings are brown bearing brown spots outlined with whitish to yellowish brown striae. On the forewing, the post-discal spot in space 4 is shifted towards the termen and not aligned with spots in spaces 5 and 6. On the tailless hindiwng, (a) the post-discal spot in space 6 is placed mid-way between the spot in space 5 and the end-cell bar, with its inner edge aligned with the outer edge of spot in space 7; (b) there is a very short tooth at end of vein 2; (c) bluish scales are present in the margin of space 1b and upper end of space 1a, and (d) a small tuff of white cilia is present just below the end of vein 1b.